The idea has merit. Once someone commits to an attack, if you move they either have to change their direction of movement to intercept you, or they have to change their aim to hit you. Mind you, movement doesn’t make it impossible to successfully complete an attack, it just makes it a little more difficult — and buys you a fraction or two of a second to put your counter-attack into action. That doesn’t sound like a big advantage relative to the effort invested. The key is that your movement happens at the same time you’re doing something else: drawing your defensive firearm. That act takes time, and if you can move quickly off the line of attack at the same time you’re drawing your movement is “free” — it doesn’t cost you anything extra. You get a little bit of something for essentially no investment. Putting this into action as a drill has some issues, though. I’ve done a lot of force-on-force training and put a lot of students through exercises where they couldn’t predict what was going to happen; what I’ve found is that people rarely stand still once the gun comes out. They move to get away from their assailant, and sometimes keep moving. Often that movement is backwards, along the line of attack, and sometimes it’s lateral — at right angles to the line of attack. The point I’m making is that it isn’t hard to teach people to move; they want to do so, naturally, in response to a threat. The exercises we run to teach them movement off the line of attack simply reinforce what they want to do anyway. They may learn to redirect their natural movement into something more defensively useful (moving at right angles to the attack rather than backwards), but we’re not actually teaching them to move. If we’re not really teaching students to move, what are we teaching? We’re teaching them to STOP. That’s really the critical part of the lesson: Stopping your movement so that you can deliver rapid, multiple, accurate defensive shots to your attacker. If you keep moving while trying to shoot at the same time, you make it harder to land accurate shots on your assailant. Yes, I know there are some people who, after a lot of practice, can make an impressive percentage of their hits on target, but no matter how good they get they will always shoot far better when they’re standing still. Moving while shooting always affects your balance of speed and precision, no matter how good you are. The key, then, is to make your move as you simultaneously draw your gun, then stop to actually shoot. That’s the takeaway from the lesson, and the real reason it’s taught. It’s surprising, though, how many instructors I talk to who find this a revelation. Movement off the line of attack isn’t possible (or useful) in every situation. If you’re between parked cars when attacked, for instance, there really isn’t any place for you to move. If you’re in a doorway (home or car), or if you’re against a wall, fence, or other obstruction, you may not have the liberty of effective defensive movement. In realistic exercises it’s common to see students backpedal — move along the line of attack instead of perpendicular to it — which, while ineffective, is still movement that affects their shooting. Teaching them to always “get off the X” as they draw doesn’t always work. Defensive movement is situational and not always appropriate, while the desire to move is in fact part of our normal threat programming. By incorporating defensive movement into a shooting curriculum, we’re really teaching students that as the gun comes out of the holster, it’s time to stop moving to make accurate shots. The moving may be situational, but the stopping is universal — the former isn’t always useful or possible, but the latter almost always is. P.S. : I’ll be teaching the importance of stopping, and a whole lot of other useful defensive skills, in my Threat-Centered Revolver course in Phoenix next month (March 17th & 18th.) The class is already half full, which means if you’d like to attend you need to register right away! Hey Buddy!, I found this information for you: "Why do we teach moving while drawing a defensive firearm?". 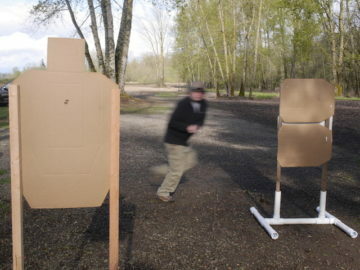 Here is the website link: http://www.grantcunningham.com/2018/02/teach-moving-drawing-defensive-firearm/. Thank you.